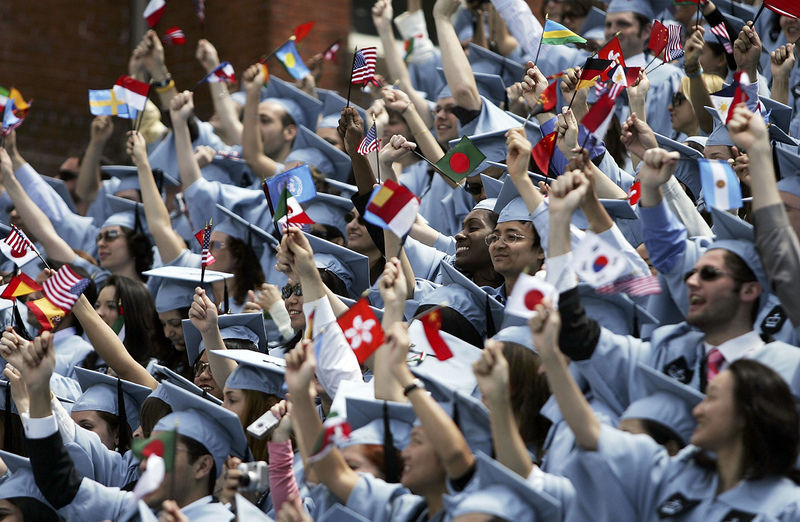 Students cheer during commencement ceremonies at Columbia University in New York City, May 18, 2005. A Confucius Institute was established at Columbia in 2011. This piece was first published on the NYR Daily on April 28, 2017. Since their beginning in 2005, Confucius Institutes (CIs) have been set up to teach Chinese language classes in more than 100 American colleges and universities, including large and substantial institutions like Rutgers University, the State Universities of New York at Binghamton and Albany, Purdue, Emory, Texas A&M, Stanford, and others. In addition, there are now about 500 sister programs, known as “Confucius Classrooms,” teaching Chinese in primary and secondary schools from Texas to Massachusetts. But while the rapid spread of these institutes has been impressive, in recent years their unusual reach in the American higher education system has become increasingly controversial: Confucius Institutes are an official agency of the Chinese government, which provides a major share, sometimes virtually all, of the funds needed to run them. Though they are housed in U.S. institutions, their curriculum is largely shaped by Chinese guidelines. Moreover, they have often been set up in secretive agreements with host institutions, which has caused Western scholars to question whether their universities are ceding undue control to a foreign government—in this instance, a foreign government well known for aggressively propagandizing its official views, censoring dissenting opinions, and imprisoning those who express them. Peterson notes what she calls the “veil of secrecy” that seems to surround at least some of the CIs she visited in New York and New Jersey, which is the reason the NAS had to file FOIA requests to get the contracts signed between the Hanban and some of those institutions. Peterson was, for example, able to make an appointment to meet the CI director at SUNY Binghamton, but this person canceled the appointment a couple of days later, citing too many other responsibilities, then told Peterson that no member of his staff would be able to meet her and that she would be barred from sitting in on a class. A similar series of events took place at SUNY Albany, she says. The Confucius Institutes, it will be remembered, are run by an agency under the very Ministry of Education that Chen heads. The Hanban website currently carries reports on the Confucius Institute’s 11th annual congress, which was held in Yunnan Province last December with 2,200 delegates participating from 140 countries. Several senior Chinese officials, including Politburo member Liu Yandong, gave speeches. On the program was a presentation of China’s “One Belt, One Road” initiative, the country’s plan to build a network of relationships across Eurasia. Chen was the official host of the event.